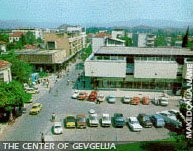 Gevgelija is a small city, located 3 km from the border with Greece, and it's located on 158 km from Skopje and from the nearby city Strumica, is just 51 away, while from Veles is 106 km away. "Gevgelija town under the mount of Kožuv" is the first thing that you'll hear from citizens of Gevgelija. 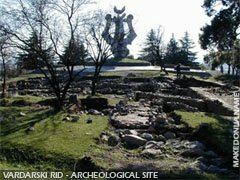 Located in the south-eastern part of the Republic of Macedonia (central Macedonia region), on the western bank of the Vardar river, there are a lot of stories about Gevgelija and the power and treasure of the area, but proved and confirmed. Zlatonosna Reka (river) which flows in the valley of Gevgelija from the mount Kožuv in which the people believe that can be found gold mines from the time of Philip 2nd of Macedonia and his son Alexander the Great. In this part of Vardar valley boats could sail, so a lot of craft goods have been transported from Gevgelija to the port Solun (Salonica). The first Railroad in Macedonia has been released in use on 9th of August 1873. Here in Gevgelija, at the beginning of the 20th century worked only a couple of flower shops, cigarettes factory and others... And what about today. Today the people of Gevgelija have a "local contest", who will have a better yard and gate, wall, fence and architectonic mix of ancient look of their house or flat. The stories tells that here in a area where the Mediterranean climate rules, own home found a lot of people who passed through Macedonia in the feudal period. They in different period gave name to the town. So in the middle of the 14th century the word "Gevgelija" has been used for the term feudal form of owning a land, and that the villagers that lived here were Gevgeli. When the Turks occupied the Gevgelija it was still a little village. The legend says that Gevgelija at the beginning, was a settlement with 10 houses. During the period of growth as can be heard a lot of people "come and go" entered and been called "gevgeli". So from that name comes the name of the town. 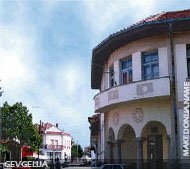 Gevgelija is mentioned for first time as a settlement in 1664 , while the status of a town was in 1886. for first time as a settlement was founded on the important road that from Solun (Salonica) and Dojran leaded to Strumica and Skopje. The market place (carsija) had a lot of shops, restaurants and other things. It has been a privilege of becoming a citizen of Gevgelija. Every citizens needs to have good looking house. Between those houses is the main library in the town made by a maestro from Debar built in 1911/1912. The oldest hotel in Gevgelija is Ottoman also called Rezil Kuka, which today is cafe. Also there is an Aman (Turkish Bath). Being on the border with Greece, on the north-south road corridor (E-75) and railway line to the Greek port of Solun (Thessaloniki), Gevgelija is an important communication center in this part of Macedonia. Gevgelija is characterized with a Mediterranean climate and is the warmest place in Macedonia. Thus, it is well suited for the cultivation of various kinds of fruits and vegetables, including some that are typical to the Mediterranean climate, like oranges and lemons. Numerous plants of wine yards with different types of grapes are also found here. Apart from agriculture, Gevgelija also has a well developed light industry and trade. Tourism is also developed with the Negorci spa, in the nearby Negorci village.